In my August 17 th entry “Hybrid Heroes”, I expressed how Ben Franklin and Rumi had on my mind throughout the day. In my imagination, they were each a Twin Wing of a bird I could ride, as I soar in my life. I named this bird “Benrumi”. I continue to feel Benrumi’s inspiration and guidance. Yesterday two more heroes of history appeared. Robin Hood and Mother Teresa. Opposites type characters, yet both “saviors” of those in need. As I am sure you remember, Robin Hood robbed from the rich to provide for the poor. 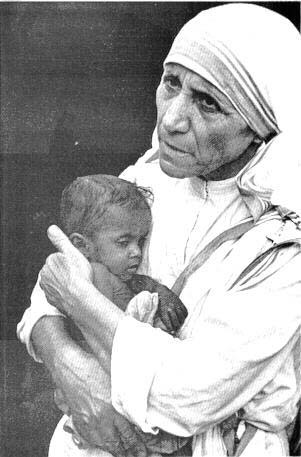 Mother Teresa, completely in love with Jesus, provided loving kindness at death’s door for the poor. In November last year, I formed a non-profit 501 (c). Now 9 months later, Twinwing.org Foundation which connects philanthropy & free trade, continues to soar. I created Twinwing.org Foundation, from being completely out of my mind, in love with life. Forming a non-profit business vehicle seemed like a natural form to make all my dreams come true. Initially the vision appeared to me after brain surgery in 1979. I saw the whole world lit up in a rainbow, bringing together separate nations into a unified whole world. Since then, I have been in preparation to make my dream come true. To birth a transformed world where all humanity is consciously connected-one family. Having said all that, it made complete sense yesterday that Mother Teresa and Robin Hood where forming a new partnership in my imagination. Picture this: Mother Teresa is the right wing, Robin Hood the left wing. Now they soar together a Twin Wing bird. They are “living transportation” helping indigenous leaders make mutually beneficial free trade with non-profit organizations. In addition, Twinwing.org provides leading edge designs for products (like hand made iphone pouches) that city people can purchase. This provides empowerment for philanthropists and consumers, adding meaning and purpose in their lives. While at the same time, providing loving kindness to native peoples, helping them maintaining their cultures and raising their standard of living. As life turns inside out in the 21st century, Robin Hood instead of robbing the rich, provides a valuable inner wealth to consumers. Mother Teresa instead of hospicing the near dead, helps “birth” the living “dead” into life. I shall call this Hybrid bird, “MotherHood!”, while together we are birthing a new world! This entry was posted on Tuesday, August 21st, 2007 at 6:30 am and is filed under Uncategorized. You can follow any responses to this entry through the RSS 2.0 feed. You can leave a response, or trackback from your own site.